Want to know what Life at Elastic is like? You've come to the right place. Hear from our Elasticians first hand as we highlight their stories and photos from around the world. 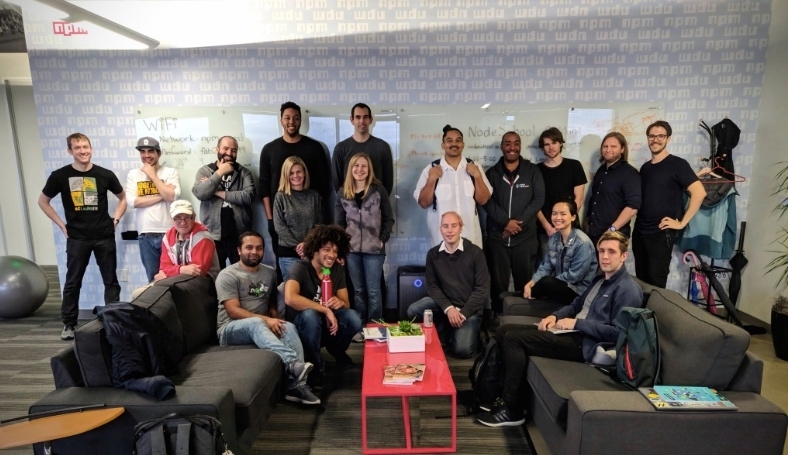 In this Spotlight, Elastician DJ Gill shares how and why he takes time giving back to his community by helping future engineers master Node.js at NodeSchool Oakland. Life@ Elastic: You’ve been on our Infra team for over a year now. What exactly does Infra do? DJ Gill: A lot! Our two main tenants are to build tools to support the application developers and to maintain a lot of the Elastic infrastructure. Things like continuous integration, testing servers, managing download proxies, and more. It's a long list. Is working on an infrastructure team or being in tech what you wanted to do when you grew up? DJ: Depending on which me you're asking, yes. Kindergarten me wanted to be a veterinarian or zookeeper. And there was a brief point where I wanted to be a teacher, like everyone does at some point, right? But I grew up here in Silicon Valley. So in high school, I'd be hanging out with my friends in their basements playing video games, and their tech parents would come down and say, "I'll help you build that if you want, instead of playing it." That was really inspiring. So that was it? Straight into tech? DJ: No, I didn't get here right away. If I'd gotten college funding or if high school guidance counselor suggestions had gone differently, I probably would have ended up in tech a lot earlier. So how did you end up in tech? DJ: Well, other than an intro course, I'd never taken any [Computer Science] classes, but I was going to meetups, and was trying to network my way into a job as a self-taught person. Then I realized I didn't know how to talk about tech, and in hindsight, I shouldn't have been trying yet. Then I'd heard this cool thing on NPR about these coding boot camps. So I started researching boot camps, and then swallowed my pride, took out a big loan, and asked my mom if I could move back in while I went to a coding boot camp. At the time, I thought it was a huge risk and wasn’t entirely certain was a good decision, but you know, I don't think I would have ended up here without it. I'm glad I did it. Was it your rocky entry into the industry that inspired you to help others interested in tech? I’m the co-organizer of the Oakland chapter, but I’ve been attending it pretty much since it started here. It's worldwide, and I recently found out another Elastician is an organizer of the Vancouver chapter. Mentors and Mentees at NodeSchool Oakland. That's DJ with the waterbottle. I’m guessing you don’t do it for the pizza. It sounds like you want to give people guidance that you wished you had. DJ: I’d just like to try to be an inspiration for folks who need it for whatever reason. My guidance counselor told me that I should do something other than tech when I told them that this was my plan. Maybe someone heard the wrong thing from their guidance counselor, you know? It seems like you’ve had some good role models. Who inspired you to get into volunteering? DJ: My mom. She’s just an unbelievably good person. She would take us to volunteer at soup kitchens. To this day, she will come out of Starbucks and an extra coffee and extra sandwich — and go in late to work — so she can sit down next to a homeless person that had asked for money on her way in. Breakfast is important, but even more important is the human interaction. She cares about people in a way that I don't think is often represented anymore. She sounds amazing. Where do you see your volunteer spirit taking you next? DJ: When I moved to Oakland, California, I wanted to start volunteering at an after school program. But the only programs I could find were the ones where students come in with their own Macbook. I feel like folks whose parents can afford to buy the Macbooks don't need to be inspired to get into tech. I think I’d like to volunteer at a high school where I need to teach basic typing skills to sophomore. Like, maybe I can be an inspiration for those kids. Yeah, I just want to be a "not-as-smart” Kelsey Hightower — I promise that's a great joke if you're deep into Kubernetes and/or black people in tech.